Christmas can be a fantastic and exciting time but also full of stresses. Many mums that do regular exercise find it hard as the classes and bootcamps tend to stop the same week as the kids break up from school. There are things you can do at home but it is hard to keep motivated with all the temptations around at this time of year. Also I find it hard as it gets colder to resist the warm, unhealthy drinks and biscuits! 1. Move more – don’t stay in one position for too long a time when you are cooking, cleaning or relaxing on the sofa – get everyone one up and moving or out, for example on a walk, treasure hunt, races or competitions. 3. Put it as an appointment in your calendar – Hopefully your partner is supportive. If you worry about spending time with them as they are not working, it’s a great way to spend quality time together. Or if they can help with childcare you do the same for them. I have had comments of people saying it’s selfish, but its not – its about your health and sanity. Get grandparents to help, you only need 30 mins to fast walk or run! 4. Plan in what you enjoy and want to do – aim for 3-4 activities a week – DVD, online workouts etc. On Periscope Rachel Homes does a 7am workout, or maybe run, walk to get fresh air, or arrange to meet or pick up a friend then you cant cancel. Bootcamp Tilford with Belinda Andrews 14th and 16th December – 9.30 Tilford Green – back on wed 6th January. 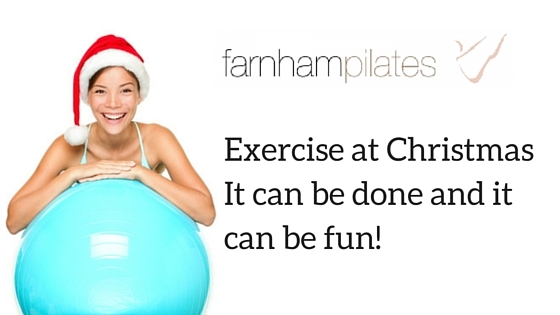 Farnham Pilates – last classes 17th-18th Dec – 8.45 and 9.45am – wear Christmas hats bring a friend or children. Sweaty Betty does classes inhouse too. 5) Don’t worry about what you wear – I put the clothes out the night before and dress in the dark and don’t look in the mirror. Then I enjoy the shower or bath later and then do hair and make up and feel much better in myself. 6. Its not always possible to exercise without the kids – so include them or watch online and do it in front of them. I think its just as important for them to see me working out and that I find it important to look after myself. Ditch the ‘either-or’ attitude. Children instinctively love to move. Resistance bands are great for playing with and balls make fun mini trampolines. Also as your children grow older, workouts can be bonding time. I’d like my oldest daughter to run or cycle with me, if its a one off they wont do it, but if its regular they will understand it’s important and will want to come with you, or simply bribe them for that Saturday night movie and popcorn. I ran a dash for colour for Phillis Tuckwell this September and my daughter and I had great fun throwing powder at each other! Other ideas could include taking the kids to the park and do step ups, tricep dips, running races and they love a circuit or obstacle course. It doesn’t need to be long, just a quick workout – 10-15mins raising your heart rate is better than nothing. 7. Do you get Back pain? – stop what you are doing, think about your posture. Have a look at our 5 days of short stretches and the relevant blogs. I am also running a 6 week programme for you to follow – details here. 8.Walk or cycle to friends for Christmas drinks or the family drive and you walk or run and meet them there. Make the most of any time you have and make time. 9. Analysis your time – Can you not go on Facebook/cooking/ cleaning for 10 mins. Swap activities or plan ahead and do bulk cooking. Get the kids to help and delegate. I find December is the best month as they have to be good and help otherwise Santa may not come! We do a points system for pocket money and points are taken off for not helping. They don’t get tea if they don’t help. I know older ones have homework but when they are hungry they will do anything to get the food quicker! 10. Don’t beat yourself up – if you don’t get time. Don’t set unrealistic expectations. Even 10 mins a day is great but even every other day is a good start! Xmas time can be stressful for mums with so many demands from work, household, family, kids plays, concerts, costume organising, parties – shall I go on? The main thing that gets missed off is you and your exercise. It is important to schedule time out for you to do exercise, eat healthily and spend the Christmas holidays to reset, reboot and recoup your body! I’ve heard mums say its the kids holiday not theirs, as they have so much to do. That’s true when they are young as the focus is on them, and then teenagers just want to relax but set some goals and prioritise for you as well! Also you either love it or you just want it over. I love Christmas but that includes the food and drink and all the naughty things, but just stay relaxed and keep a positive mindset and tell yourself you will enjoy this lovely time. It’s also a reflective time and a chance to think about what is a priority to you and how to make it possible! I am struggling fitting in the London Marathon training, as a non morning person it is a struggle to get up at 5.45am and run, but I’ve been doing it for 4 weeks now and trying not to think too much about leaving the warm bed and just getting it done. As I’ve been getting out 4 times a week my fitness has really improved! But I’m very aware as the holidays start and the weather gets colder it is hard to keep going or get started!! 2. Gratitude – Encourage the kids to talk about what they are grateful for over Christmas ie food and presents compared to those with nothing or very little. At bed time we talk about what was the best thing they did and what they are looking forward to the next day. 3. Reflection – Reflect on what you and the kids need in life- take your life, and encourage the kids to, in their own hands. It is possible to say no to some things..
4. Expectations – Don’t have high expectations yourself ie of the perfect house/being tidy – it wont! 6. Take some time for you – Give yourself permission to think about you what you want to schedule in, i.e. 10 mins bath, chill out before the next family or social event. 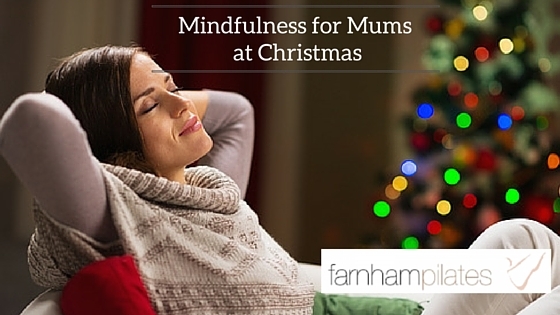 To totally relax and recharge, why not try our mindfulness video. This is just £4.99 and you can put it on whenever you feel stressed to help you recharge and reset. Click here to find out more. 7. Balance – Even out the days events. If you are too busy or stressed the body goes into survival mode and store fat! Get fresh air, go to the beach, chase each other! 8. Meditate – when washing up to just clear your mind. 9. New years resolutions – if you don’t do something to make you happy / help you / please you NOW then when will you? 10. Food – have a day off unhealthy food, think 80 / 20 rule. Healthy veg soup with left overs? 11. – Sleep – Get 7 hours plus to reduce stress. A good way to get set for this season would be to come to our Pilates and Wellbeing day on Thursday 10th December 12-5pm at our Pilates Garden Studio in Rowledge. All are welcome, bring friends and children. There will be the chance to try the reformers, a Heated Pilates session, 20 mins massage with Aase Waterman, Reflexology, and Reiki. Click here to find more details. Or, to have a tool you can rely on to help you reset and rebalance whenever you need to, why not download our mindfulness video. It will take you through 10 minutes of exercises that will help you keep balanced over the busy festive season with breathing and relaxation exercises, which can be done when you need to. It is just £4.99 and you can click here to find out more or pay via the paypal link below to have the video sent straight to your inbox. Have a lovely festive season with your loved ones but don’t be afraid to take time for you too. Can Christmas give you back pain? The first line of treatment has traditionally been paracetamol, but new research has found it may be no more effective than a sugar pill. It is better to prevent by strengthening your abdominal muscles and back to help stabilising then stretching and strengthening around your weak muscles. The most important thing to consider first is what’s actually causing your lower back pain. By considering this question you’ll be able to choose the right techniques or treatments to get to the root cause and move towards a much speedier recovery. For the most part, lower back pain is caused by strains to the soft tissues, the muscles, tendons or ligaments, and/or to the joints underlying the commons problems. Here are some common activities over the festive period that can contribute to back pain and some tips as to how you can minimise this. 1. Cooking, washing up, prepping food, you may be standing for long periods of time. This can cause sore feet, swollen ankles and puffy legs, tense shoulders and ultimately back pain. 2. Making beds, shaking duvet, bending, lifting, moving items, getting the house ready, cleaning, gardening – clearing leaves and digging, All can cause sore wrists and knees and back pain. 3. Sitting for long periods – writing cards, wrapping etc all causing sore hands and fingers and back pain. All of the above can cause these common problems …. REPETITIVE STRAIN INJURY –More commonly seen in the upper body, this type of injury can occur in the lower back when an action is continually repeated over a long period of time, causing stress to the joints or soft tissues. How to fix it? Try to adapt and balance the movement of your body throughout the day. If a pattern of movement is unavoidable then stretching in the counter direction would be beneficial. All of the above activities could contribute to repetitive strain injury so try and vary the jobs you do and don’t spend to long on one thing. Your aim is to balance out your body preventing one side taking all the strain. A regular massage with an experienced therapist may be helpful too. Or massage your feet or have a game everyone massaging feet. Always consider your posture, look in the mirror look at how you stand and sit, pull the shoulders back, lift up through the spine. Stop and stretch every hour. Even going for a gentle walk for five minutes can do wonders. Low impact regular exercise is best such as yoga, pilates, swimming and walking. This will also help your stress levels over the festive season too. Regularly move shoulders, roll them and do back stretches. Be mindful of posture alignment and back pain and use your pelvic floor engage the abdominals before you lift . This is probably the most common injury to happen to the lower back and quite often occurs when lifting, over reaching, so when moving furniture around, making beds etc. Overreaching, twisting or stretching causes the muscles, tendons and ligaments in the area to tighten to prevent further damage and inflammation will build up as part of the natural healing process. Fast treatment is the most effective for this. Always bend at the knees not at the back before lifting. How to fix it? Immediately put an ice pack on the area for ten minutes at least. Repeat this several times until the inflammation begins to subside. As with any injury rest is important to allow the body time to heal, but don’t spend hours sitting or lying down as this could make it worse. Find a good balance and when it has calmed down a little, stretch the area out with exercises such as shoulder bridge, rock on your lower back. You may find massaging arnica cream into the strained area beneficial. So do enjoy the festive season, but don’t overdo it. Make time for yourself and make sure you enjoy some exercise too which will help keep your body in tip top condition.